AlamyA popular stereotype of the life of the working mom. A few weeks ago I was speaking to a good friend of mine who is responsible for hiring decisions at his company, and he shared with me that he does not like to hire working mothers. He confessed to having a prejudice against them. Since I am a working mother, I immediately wanted to determine why his prejudice developed, and if there was any merit to his viewpoint. According to my friend, there are a few areas of concern he has when hiring a working mom. He is entitled to his opinion; however, for purposes of this article, I am going to list them as fallacies, and respond to them with the reality. According to my friend, he cannot rely on his working mom employees because he never knows when they will call in sick due to their child's illness. He stated that one woman in particular called in at least once a month because her son needed medical attention. Apparently, an unspoken concern amongst some hiring managers is the fear that a working mom will grow tired of the day-to-day grind, miss her child, and decide without warning that she needs to stay at home full time. Despite not having any actual evidence of this statement, my friend shared with me that it is common knowledge to assume that when a working mom works from home, it is primarily to finish laundry, and take care of her children and not in fact to focus on her work. As a hiring manager, my friend is looking for someone who has complete devotion to the company and makes work a priority. He assumes that if a woman is a mother, her children will always come first, at the detriment of her corporate loyalty. I can assure you there is nothing worse for a working mom than to get a call from a childcare provider, or school letting you know your child is sick. From the time my son started daycare at 6 months old, until he turned 3, I felt as though he had a never-ending ear infection with occasional unknown illnesses making appearances at the same time. Each time my son was sick, though, my husband and I waged a war over who could afford to take the day off from work. We would both lay out an argument over what our day would look like and then determine who had a better case. 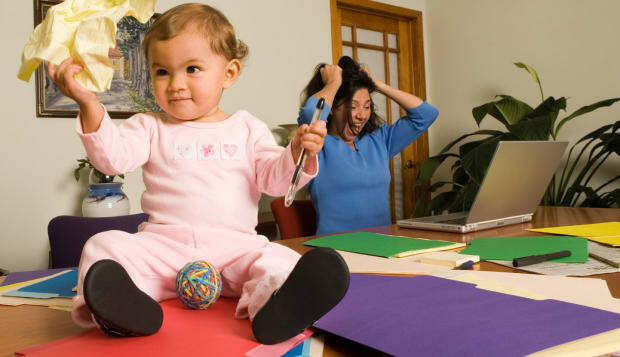 The parent with the more compelling work need would go to work and the other parent would call in sick. This worked for the most part, until one day my son's daycare called to tell me he had pink eye. We both had big days the following day, so rather than either person concede, we called in the reinforcements, and flew my mother-in-law down to watch my son. If there is a mom who is constantly calling in sick, it is not her fault, it's her partner's fault for not stepping up and taking turns. Unless your job means life or death to someone, then I think each partner should take turns calling in sick. I never want to call in sick to watch my son. I know that as a working mom I have a target on my back, and I never want to prove a fallacy like the one my friend believes. That being said, I am not the only working parent in the house, and sometimes for the sake of my marriage and relationship, I need to step up and call in sick. There is usually a moment in a new mom's life when she realizes she is made to be a stay-at-home mom or she is made to be a working mom. I came to this realization when my son was 2 months old and I returned to work. Despite the fact I cried like a baby during my drive in, after a few minutes back to work, I remembered how much I missed it. I love my son to death, but when he was a baby, I had a difficult time trying to please him and constantly felt frustrated. When I am at work, I know exactly what to do to please my boss or my clients. They are much easier to understand than my son, and the only reason I would become a stay-at-home mom is if it made sense for my family finances. Most women I know who worked after their children were born and then became a stay-at-home mom, made the decision because of the overwhelming costs of childcare versus the salary they earned in their job. If a working mom were the breadwinner of the family, she would never leave a job and sacrifice her family's livelihood. So if you want your working moms to stay, maybe you should pay them more and make it less compelling to leave. I will confess that when I work from home, I do sometimes do the laundry and fix dinner in between work assignments. However, I also go to the bathroom with my phone in hand so that I don't miss any calls or emails. I don't typically shower, get dressed up, commute in or chat with my co-workers, which saves me hours of wasted time I would have in the office. I start working before my co-workers get into the office and I am responding to messages long after they have left. I have been known to take conference calls in the back corner of my closet while secretly praying that my son won't find me or make noises that someone can hear. There are many conveniences to working from home; however, I have never felt as though it made for an easier or less stressful day. In fact, despite the laundry and dinner cooking, I get more accomplished on any day from home than I do in the office. Is my child the first priority of my life? Absolutely! I would never put anything above him; however, it doesn't mean that my work or the company I work for is a distant second or third place. I love working. I have worked since I was 14 years old, and I gain a tremendous amount of pride from what I accomplish everyday. I understand the value of a paycheck and the company that provides me with this paycheck. I have missed Halloweens, parent-teacher meetings, art shows and other events in my son's life because work needed to be a priority for one reason or another. I love my friend dearly; however, I believe that he is grossly mistaken in his belief that hiring a working mom is too much of a risk. I would argue that I would want to prioritize hiring a working mom. Yes, we are excellent multi-taskers, hard workers, and team players. We are also filled with lots of mother's guilt that forces us to strive not only to be better moms, but better workers as well.